Straight from the runway and right to your fingertips, Dermelect Cosmeceuticals launches ME’s Fall/Winter 2013 Lacquer Collection, Front Row. Featuring four new hues that complement the season’s hottest trends, these lacquers will also keep your nails healthy with Dermelect’s signature anti-aging & peptide-infused formulation designed for women who desire to grow out long and strong natural nails. "From the fur frenzy to fierce patent leather, Dermelect’s Front Row collection is all about texture," says Celebrity Nail Tech, Elle. "These colors almost mimic expensive luxury fabrics from this season’s runways." The first coat instantly bonds to the nail, while the second fuses with the base coat to create a flexible web of color that resists chipping and improves brittleness. 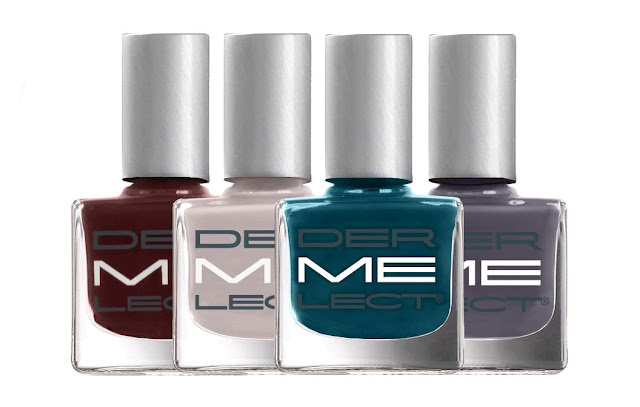 The ME colors combine fast drying, high shine and a healthy 'green' dose of vitamins, peptides and moisture, offering a colorful solution to the contemporary woman’s beauty concern—aging nails and hands. Dermelect’s ME Front Row collection, available August 2013, retails for $14.00 and can be purchased online at www.dermelect.com and at high-end apothecaries, beauty boutiques, salons, spas, medi-spas and doctors offices.